Symptoms usually start in childhood or young adulthood. People often seek medical help, because they are seriously ill from sudden symptoms of high blood sugar. The person may not have symptoms before diagnosis. Usually the disease is discovered in adulthood, but an increasing number of children are being diagnosed with the disease. Episodes of low blood sugar level (hypoglycemia) are common. There are no episodes of low blood sugar level, unless the person is taking insulin or certain diabetes medicines. It cannot be prevented. It can be prevented or delayed with a healthy lifestyle, including maintaining a healthy weight, eating sensibly, and exercising regularly. As a type one diabetic, I spend so much time explaining to people the difference, “No. It’s not the same kind your grandma has. No. Exercising won’t make it go away. No. I did not eat too much sugar as a child. No. Eating vegetables won’t get rid of it.” Blah blah blah…. 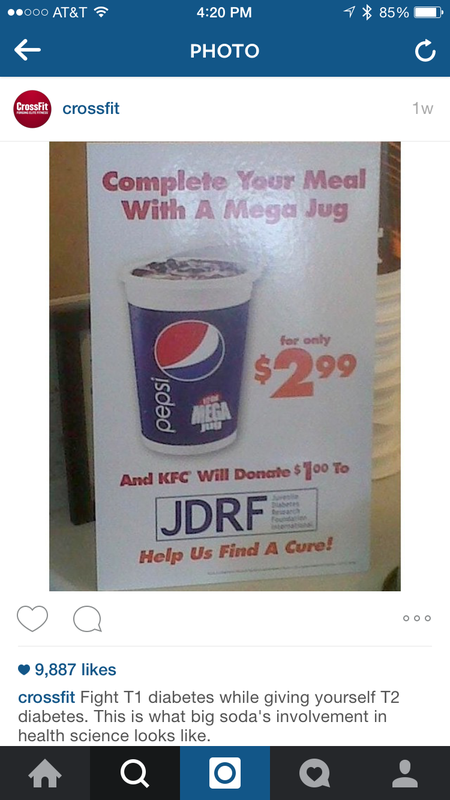 So thank you Crossfit for placing ALL diabetics into ONE category with your initial ignorant post. I can’t wait until the next time my blood sugar is low and I reach for a Coca-Cola and get to explain why it’s OK that I drink that Coke. So again, thank you Crossfit for adding to the confusion. So now Crossfit (after the extreme backlash they received from the public and celebrities like Nick Jonas) decides to re-direct their insult directly to type two diabetics. First of all, this meme is just stupid. Second, as a type one diabetic, I do struggle with understanding how someone could let themselves get type two diabetes. I certainly don’t eat the best all the time, but I do work out a lot; and, if I could get rid of my diabetes or prevent it, I certainly would. I would give up sugar for the rest of my life if I didn’t have to take one more shot or have to think twice about high or low blood sugar. I would never wish this disease on anyone; and, if someone has a choice, to change their lifestyle to avoid getting it, I cannot understand why they wouldn’t. That said, for a gym or fitness program to take direct, insulting stabs at people is just wrong. In my eyes, being healthy is so much more than how many deadlifts you can do or how big your muscles are. It’s about being well-rounded in life. It’s about staying positive and having a good self-esteem in addition to the physical fitness. Yes, obesity can cause health issues, a lot of health issues…more than just diabetes; but, why wouldn’t a gym that is promoting health and wellness want to promote in a positive way? Crossfit missed out on the health of the mind and spirit when they chose to insult people. Why not post genuine facts about the health risks associated with diabetes and ways to avoid them instead of posting satirical memes? Leave that for the trolls. Ok, really? Just shut the F*$# up already. They just won’t drop it. I know fellow T1Ds that are embarrassed to tell people about their disease and it’s because of the picture painted by companies like this. The company is pathetic and places themselves on a pedestal above others. They’d rather argue with the public than promote their company in a positive light. Doing Crossfit causes injuries because people push themselves too hard, too fast. Only people who don’t eat sugar are allowed to do Crossfit. The Crossfit phase will pass. 10 or so reasons to LOGIK! While I totally understand your frustration with CrossFits blanket and seemingly naive statements about type 1 diabetes I think this article somewhat does the same thing. 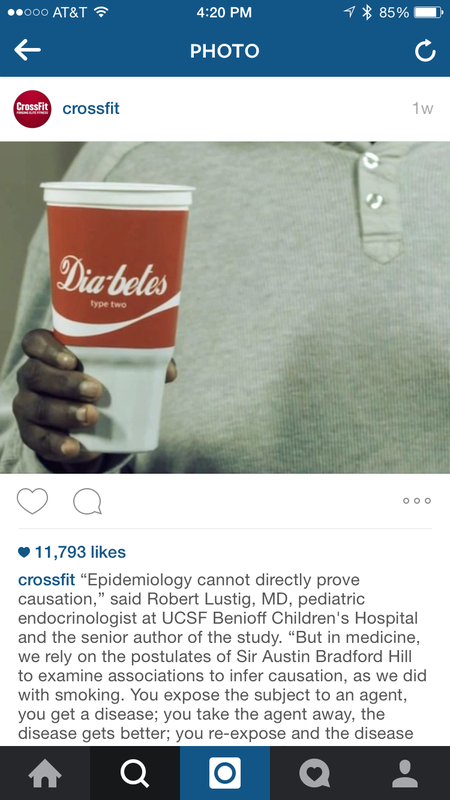 Crossfit made an uneducated blanket statement about type 1 diabetes. However, you are doing the same here. “Researching” Crossfit rather than trying it and experiencing it can lead you to one sided opinions and it seems it has with what you’ve found in your research. Crossfit is actually about MUCH MUCH more than how much you can deadlift. It is a community of people dedicated to their health and fitness who support each other through not only working out but healthy eating habits and nutrition education. Also, Crossfit has been around since 2007 so it is probably safe to say it’s not a “phase”. Have you researched injuries related to running and other high intensity sports? They exceed the number of injuries caused by Crossfit. Crossfit doesn’t cause injuries. Poor coaching does (as in any sport). I was a competitive gymnast my entire life before I started Crossfit and I endured way more injuries and long term physical ailments from that than I ever have with Crossfit. 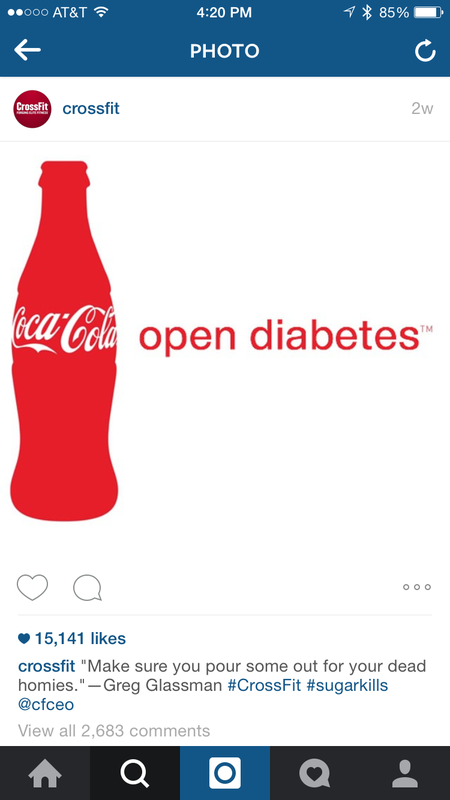 I am by no means bashing your opinion and I actually agree with you about Crossfit’s IG postings about diabetes. However, I just think you should learn more about it and experience it before you do the same thing and make negative statements about something you might not know as much as you think you know about. I can appreciate what you’re saying and I don’t doubt there are truths to it. I wrote this blog with no intent to do research or investigating into Crossfit. For the official Crossfit IG and Twitter page to post those memes is enough for me to know it’s a community I never want to be a part of and this blog was written to throw the same dirt back in their face. Non-researched, opinionated, angry dirt. I believe there are wonderful people in the Crossfit community which is why I wanted to share this. Why stand behind a company that paints their own image in this light? Okay, I’m joking, but I have otherwise totally rational friends who are crazy CrossFit-ers and I just don’t see the appeal. It makes people ugly. And you are a fabulous writer! LoL! Thanks Margaret! And I love that you mentioned Abercrombie because I almost worked that company into this post too! Ha! So because the social media person for crossfit doesn’t understand the difference between type 1 and type 2 diabetes, you believe all people should boycott their business? So nevermind the fact they have helped millions of people lose weight, become healthy and have more self esteem?